Gong Xi Fa Cai! The callithump of Chinese drums and cymbals played havoc with my ears as the pungent miasma of spent fireworks assaulted my nose. “These are my people!” I beamed. An equal opportunity celebrant, I was in my element. I picked my way through the ankle-deep sea of technicolor metallic streamers and confetti. “Looks like a dragon exploded,” I mused. Shuffling from market to crowded market, each festooned with the accoutrements of the holiday, I searched for authentic goodies with which to welcome the Chinese observance of the Lunar New Year in style. Definition: Chinese New Year, also known as Spring Festival, is a dazzling two-week long celebration occurring in January or February, a banquet for the soul that is laden with more symbolism than a Jungian interpretation of a Fellini dream sequence inspired by a Carlos Castaneda novel. 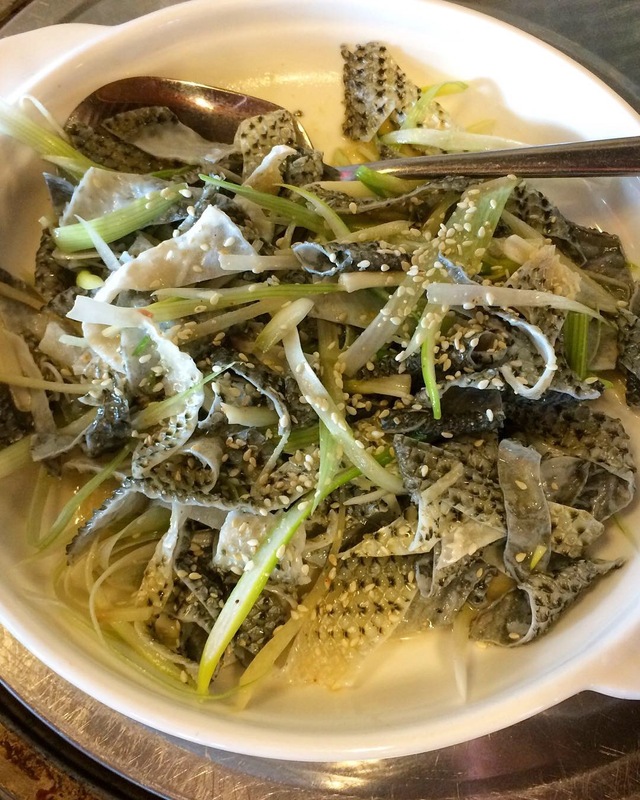 The shape of the holiday’s foods suggests their analogue: dumplings are crafted to resemble Chinese gold or silver ingots, long noodles emblematize a long life, melon seeds epitomize fertility. Color plays a significant role as well: mandarin oranges allude to the color of gold. Sweets are often tinted red, the color of good fortune in Chinese culture. But nothing is more traditional to the Chinese New Year banquet than food-word homophones. As any precocious third grader will tell you, homophones are words that sound alike but have different meanings (for, four, and fore in English, for example). At these festive gatherings, a whole fish will be served, because the word for fish (yu) is a homophone for surpluses. Also gracing the table will be Buddha’s Delight, a complex vegetarian dish that contains an ingredient the name of which sounds like the word for prosperity. (We don’t have that kind of thing in western culture, but maybe we should. Imagine if you rang in the New Year at an American restaurant by ordering the surf ‘n’ turf, a certain portent that this would be the year that you meat your sole mate. And no traditional food is more important than the ubiquitous Chinese New Year delicacy, nian gao, a glutinous rice cake sweetened with brown or white sugar and a homophone for “high year” — with the connotation of elevating oneself higher with each new year, perhaps even lifting one’s spirits. Now, I had seen nian gao dished up and steamed in aluminum pie pans in every market in New York’s five or so Chinatowns. But one particular variation packaged in a six-inch wide container shaped like a Chinese ingot (as many items are this time of year) caught my eye and beckoned to me. As I inspected it more closely, I realized that I could not for the life of me fathom how it open it! This fact alone was sufficient bait; I stood in line with my fellow revelers, paid, and took it home. With bugged-out eyes and a glower that betrayed both puzzlement and frustration, I turned the semi-translucent vessel over and over again like someone who had reached a cul-de-sac with a recalcitrant Rubik’s Cube. The object was fashioned of two mirror image concave pieces of plastic fused together — plastic somewhat thicker than that of the average shampoo container — too thick to squeeze easily, for sure, and inseparable along the seam. I could make out an air bubble which migrated as I shifted its orientation, so I had a clue as to the texture of its contents — typical semi-firm glutinous rice cake, perhaps with a little syrup around it. Searching for an instruction manual, I found that Google had abandoned me: either no one else on the planet had ever encountered these contrivances or everyone else on the planet buys them every year and I am the only soul who is too inept to persuade them to yield their bounty. There was a tissue paper-thin label stuck to the bottom that showed the “best before” date as May, so even allowing for my customary procrastination, I had some time to solve the mystery. As long as that case remained closed, the case was not closed. Wait a minute. What if some sort of key was hiding beneath that slip of a label? A slot to pry the two halves apart or a helpful arrow embossed on the obdurate plastic? Slowly, carefully, I began to peel back the label. THHHHPPP! The tiny air bubble instantly expanded to fill half the case as air rushed inside. Could it be that this gossamer leaf was the only protection the rice cake had from the elements, furry predators, and me? Such was the fact. But then, I was confronted with a further conundrum. Lurking beneath said label was a hole the size of a half dollar. (Remember those?) This carapace was obviously a mold constructed so that its contents would delight the eye when served. But the only way I could see to get to the goods inside was to dig the stuff out with a fork! Not what they intended, I was certain. Somehow, there had to be a way to pry the halves apart without damaging the springy contents. I hooked my thumbs on either side of the hole and yanked. Gnrrgh! Nothing. I laid it on the kitchen counter and pressed down with as much muscle as I could muster hoping that it would split along some weak, unseen fault line without damaging the contents. Again, it did not succumb to my efforts. I grabbed my nastiest knife and attempted to slice through the case along the seam. Nope, that’s not it either, I thought as I licked my finger where I had cut myself when the blade slipped. Silently, the ingot mocked me. Was it designed this way on purpose? Some sort of arcane object lesson about anything worth achieving is worth struggling over? Or conversely, was it perhaps trying to tell me that I would never achieve riches, no matter how much I persevered? Frustrated, I stashed the thing in a corner of my fridge. Days passed. The days melded into weeks. It was time to begin plans for Thanksagaingiving. Definition: Thanksagaingiving is a joyful, annual family ritual. Not content to celebrate the merely dozens of diverse international and American holidays, each with its own panoply of tempting traditional foods, I created one more. Over many years, I have developed, tweaked, and perfected an elaborate Thanksgiving menu that I prepare annually, much to the delight of my clan. And over those many years, we would ask ourselves, why don’t we do this more often? Pondering the possibility, we recognized that just about every month has some delectable holiday or seasonal foods associated with it. But there is that frigid, desolate chasm between Chinese New Year and the promise of tender spring vegetables that cries out for a joyous — and delicious — festival to uplift us from our disheartened doldrums. Enter Thanksagaingiving. When we give thanks. Again. And rerun the whole November spectacle. Invariably, each day as I loaded the fridge with more ingredients for our feast, it became necessary to move the Chinese ingot around to make space for the latest bounty. Now onto the second shelf, the customary residence for leftovers, now far back into the lower left corner where that jar of homemade boysenberry jam had been languishing for the last three months, now precariously balanced on a tall bottle of pandan syrup lying on its side in the least accessible corner — where the ingot unfailingly teetered, slipped, and fell, locking its neighbors into an exasperating jigsaw of jars and urns that prevented anything from being extricated from the shelf. I had no choice but to toss it. Thanksagaingiving came and went. We happily devoured our Roast Turkey with Chestnut Cornbread Stuffing, Dandy Brandied Candied Yams, Maple Sugar Acorn Squash, Corn Pudding, Scalloped Potatoes with Leeks and Bacon, and the subsequent procession of turkey sandwiches, turkey tetrazzini, turkey burritos, and turkey soup. The fridge was once again barren. Wistfully, I gazed at the empty spaces that my forlorn little nian gao had been sequentially evicted from. Had I forsaken it prematurely? Would one more hour of negotiation have solved the mystery? Nostalgically, I remembered all the time we had spent together getting to know each other. But then, I realized that all was not lost — come next Chinese New Year, I could purchase another ingot-encased nian gao and try again. I felt my spirits lifting. It had been the maiden voyage of a new annual tradition! A self-professed equal opportunity celebrant, I relish the prospect of participating in international holiday traditions and Chinese Lunar New Year abounds in them. I was delighted to take part in one such ceremony recently, Lo Hei, also known as Prosperity Toss, which got its start in southern China and migrated to Singapore and Malaysia. 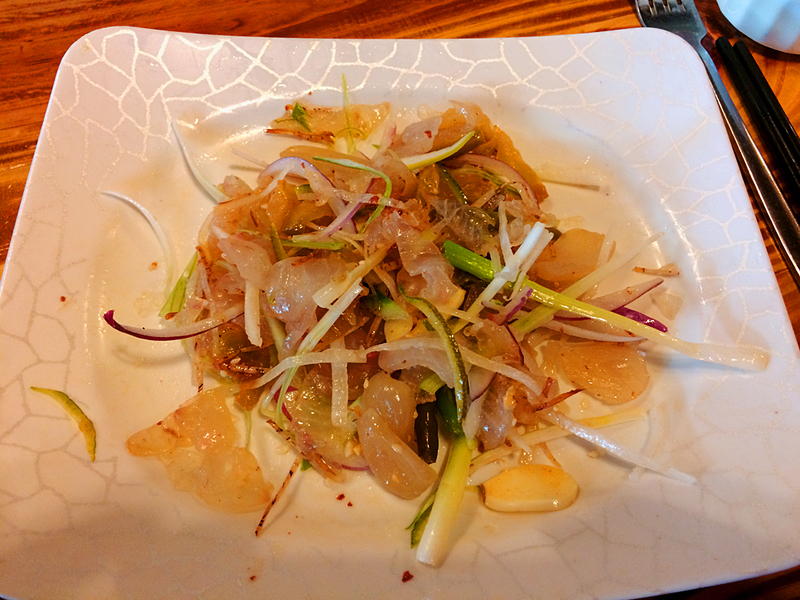 It entails an elaborate ritual involving particular foods selected for their cultural symbolism, the most important being fish in the form of a Cantonese raw fish salad. 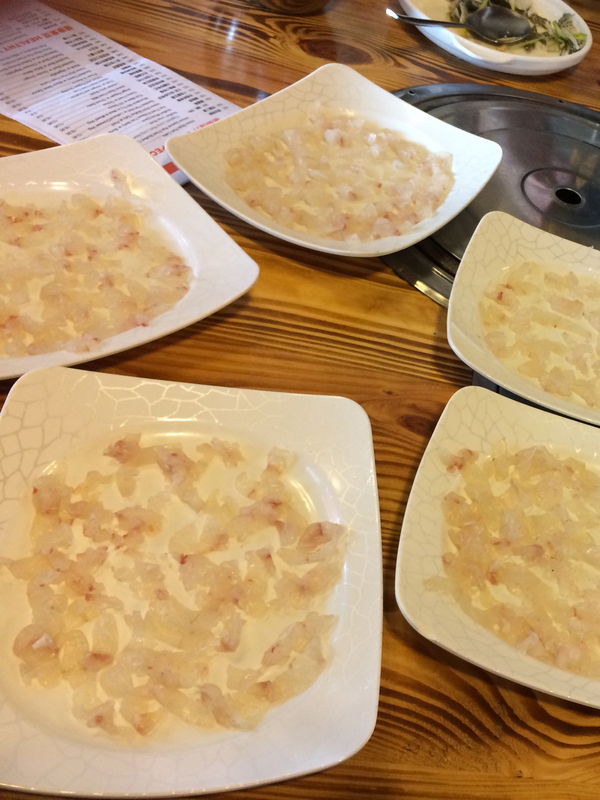 The Chinese word for fish, yu (魚), is a homophone of the word for abundance; Yu Sheng (literally fresh fish and the name of the dish) stands in for increasing abundance. 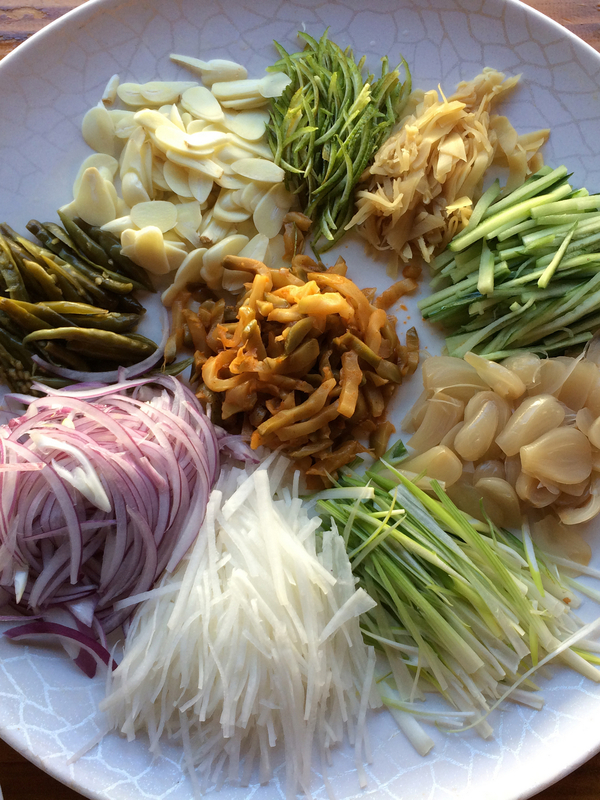 Shredded raw vegetables and seasonings, each with its own meaning based on appearance or name, are added one by one with appropriate phrases corresponding to each; good luck, wealth, eternal youth and the like appear in turn. It climaxes with all participants tossing their ingredients in the air, the higher the more propitious, and chanting “Lo Hei” (pick it up) along with auspicious phrases for a bountiful New Year. Of course, the activity is more like vigorously tossing a salad where no ingredients are actually lost in the process: it’s the symbolism that counts. The finished plate, dressed and tossed. 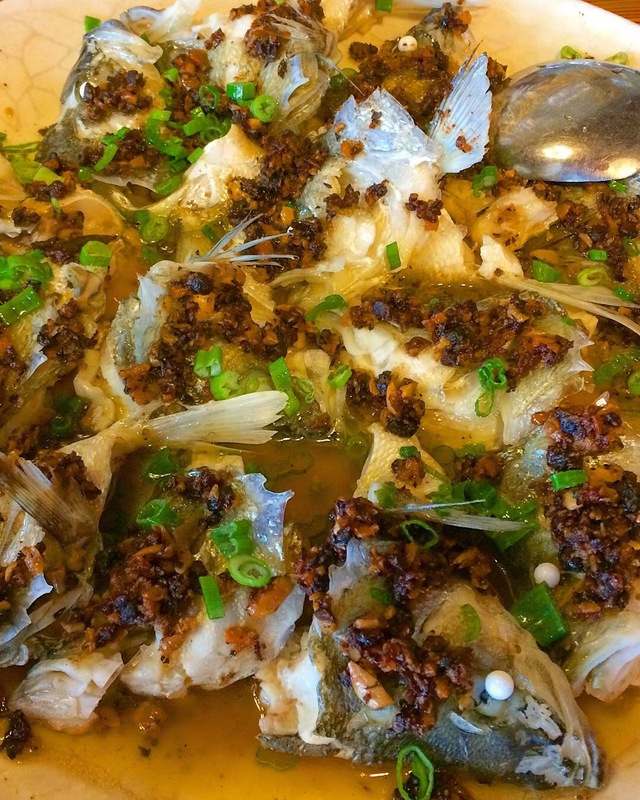 At Shun Deck Restaurant, 2332 86th Street, Brooklyn, all parts of the fish are used and are served in several courses. Very sustainable. 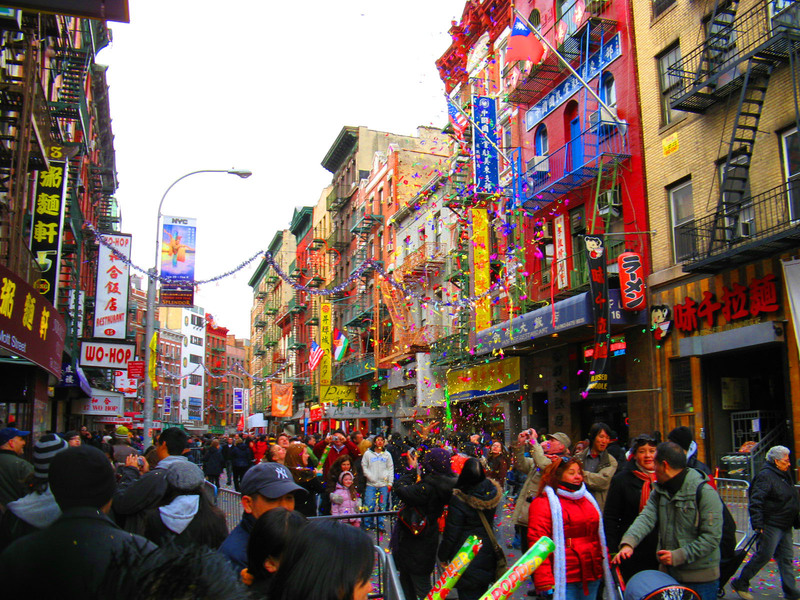 The Chinese celebration of the Lunar New Year is upon us! One aspect of the holiday that I particularly enjoy is how wordplay and homophones factor into the selection of traditional foods. An example is nian gao, a glutinous rice cake sweetened with brown or white sugar and a homophone for “high year” – with the connotation of elevating oneself higher with each new year, perhaps even lifting one’s spirits. This is the Year of the Pig 🐷 which, of course, is my cue to taste every traditional delight I can get my trotters on, but there was one year when the means by which to sample a particular nian gao turned into a complete mystery. A reminder about tomorrow’s NY Indonesian Food Bazaar (Saturday, January 26) at St James Episcopal Church, 84-07 Broadway in Elmhurst, Queens. It feels like each time I go, there’s something different to taste – and everything I’ve tasted has been wonderful. Here are a few treats from previous monthly events. 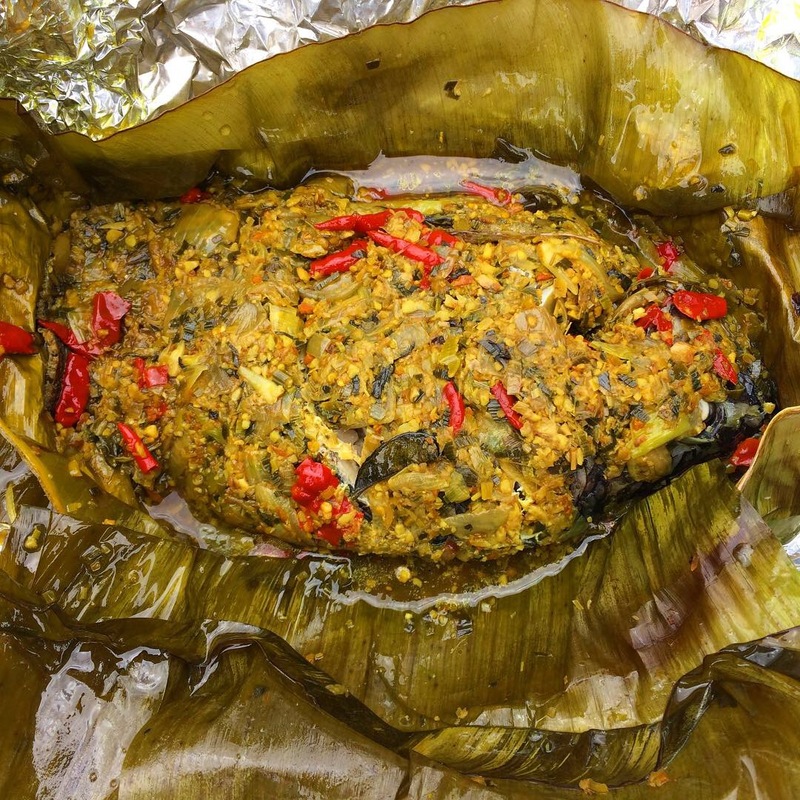 Ikan Mujair Pepes – Ikan means fish, Mujair refers to the Javanese inventor who experimented with raising freshwater tilapia, and pepes is a method of cooking that uses banana leaves to seal in flavors. 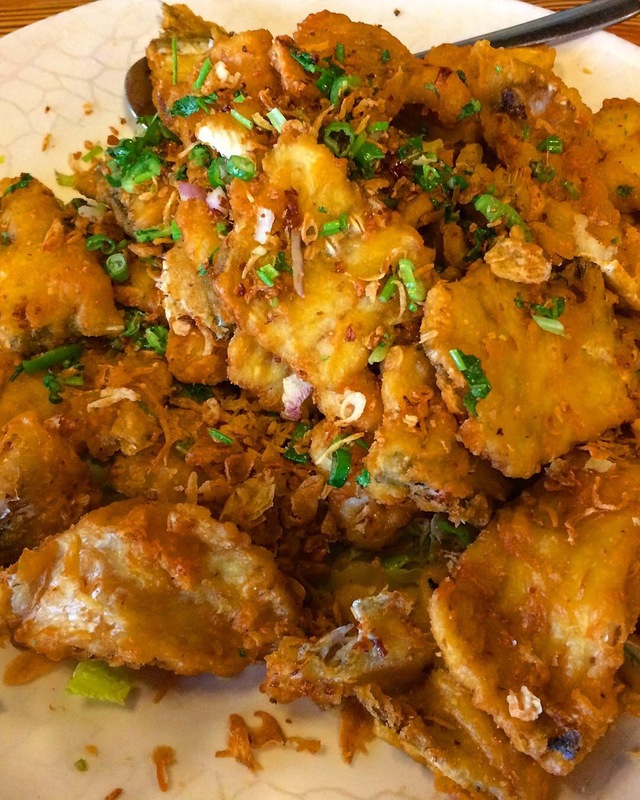 This savory fish was coated with shallots, scallions, lemongrass, garlic, chili, turmeric, and candlenuts. 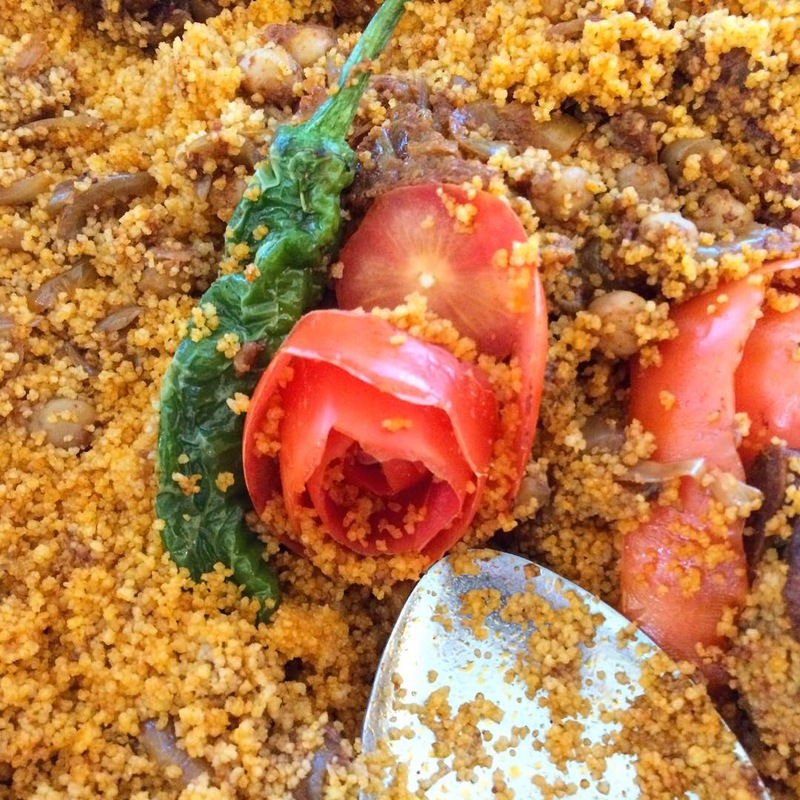 Babi Rica, a delicious pork (babi) dish hailing from Manado, the capital city of the Indonesian province of North Sulawesi from Kantin Rica Rica’s table. 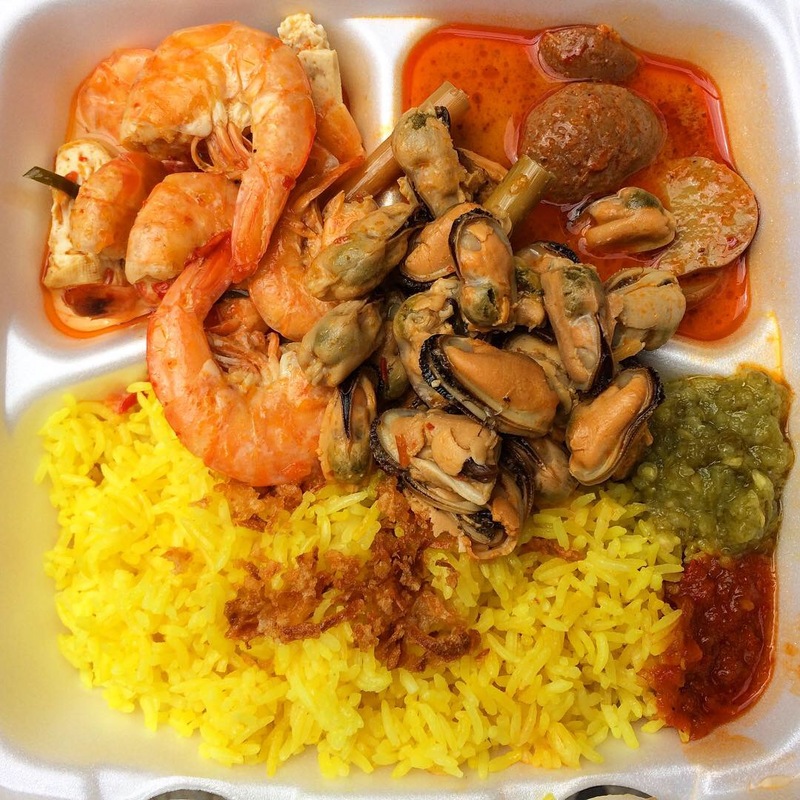 One of the happiest aspects of the bazaar is the opportunity to pick and choose a bit of this and a bite of that; this plate featured fried tofu, shrimp, mussels, and jengkol, the outsized seeds of a legume tree that taste like a tender, meaty bean served over yellow rice with two spicy sambals because 🌶️ is the name of the game. My Indonesian dessert weakness from the folks at Enak Iki: Martabak Manis (manis means sweet). 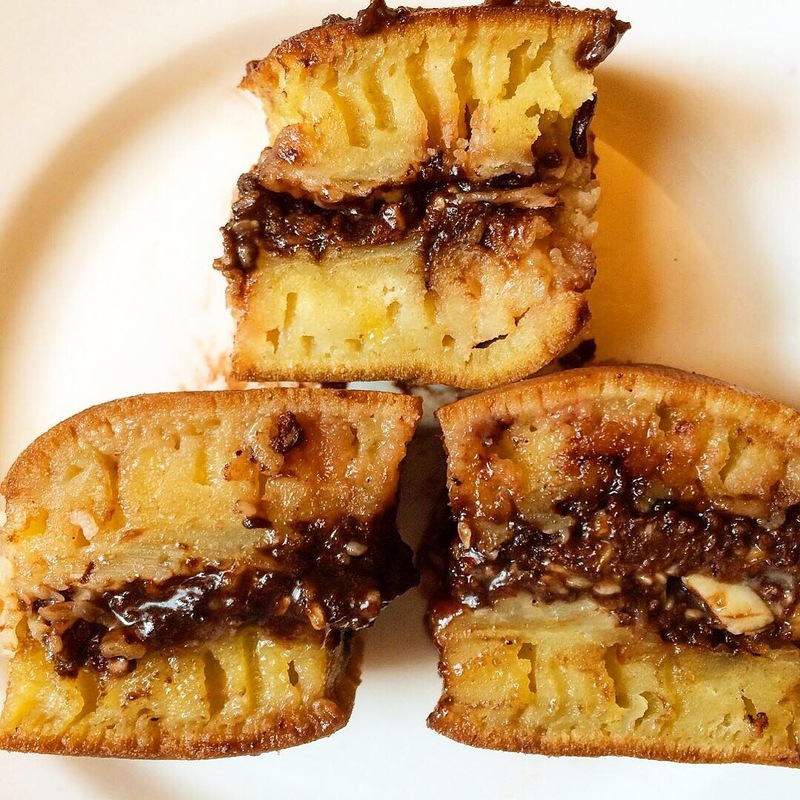 This kind of martabak has the texture of a soft crumpet; the mixed version (shown here) is folded around chocolate, peanuts, grated fresh cheese, and sesame seeds. So good! 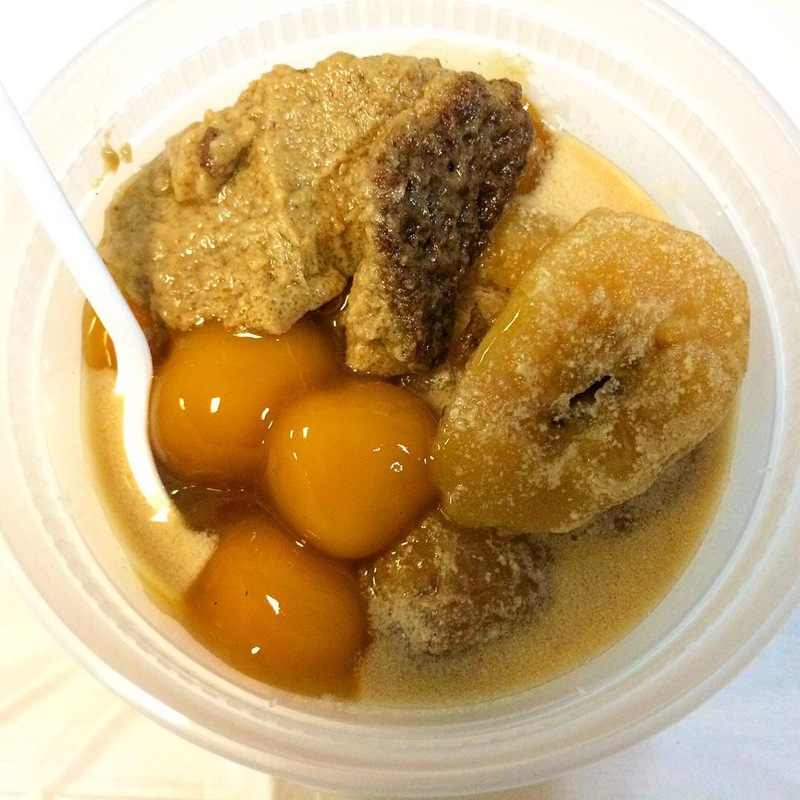 Bertha from IGA offered up this Bubur Kampiun, a porridge (bubur) with a base layer of rice flour pudding, topped with plantains in coconut milk, glutinous rice balls and palm sugar custard. She told me this is sometimes served as a sweet to break the Ramadan fast and sometimes simply served as breakfast. Since kampiun means champion in Indonesian, I guess this is the Breakfast of Champions! I attend these events regularly, so expect to see more posts soon. Follow IGA on Facebook at https://www.facebook.com/IGAUSA2018/ to learn when their next event will take place. You don’t want to miss it. 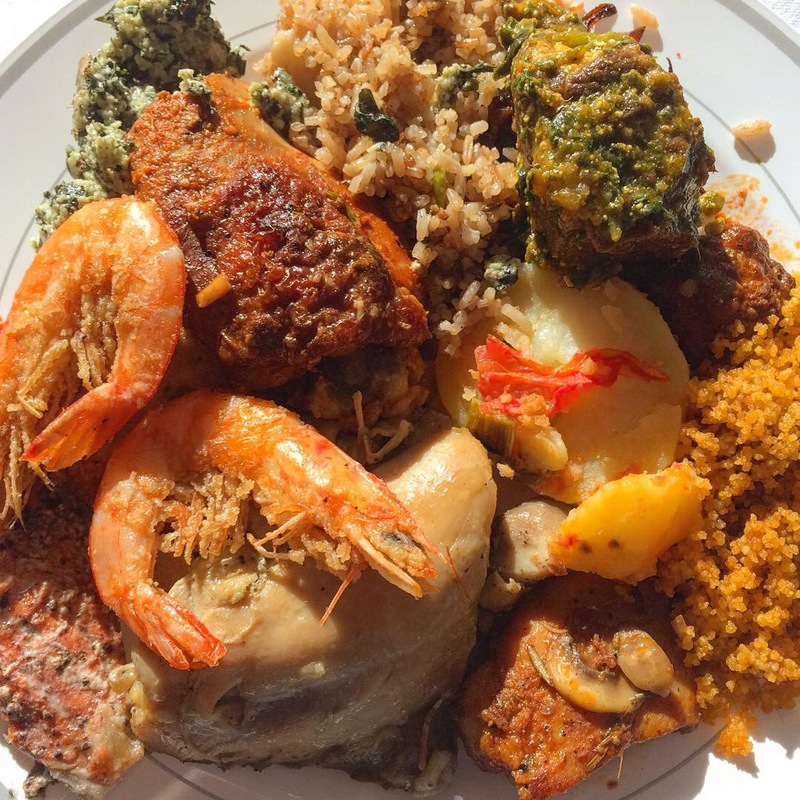 The United Nations African Mothers Association (UNAMA) holds an annual fundraising event that takes the form of a buffet luncheon featuring home cooked food representing numerous African nations. Their mission includes improving the socio-economic conditions of women and children in Africa as well as promoting its diverse, rich culture. Held this year at the Consulate of Nigeria, we enjoyed dishes from Burkina Faso 🇧🇫, the Republic of Cameroon 🇨🇲, Côte d’Ivoire 🇨🇮, Kenya 🇰🇪, Tanzania 🇹🇿, Nigeria 🇳🇬 and many more. 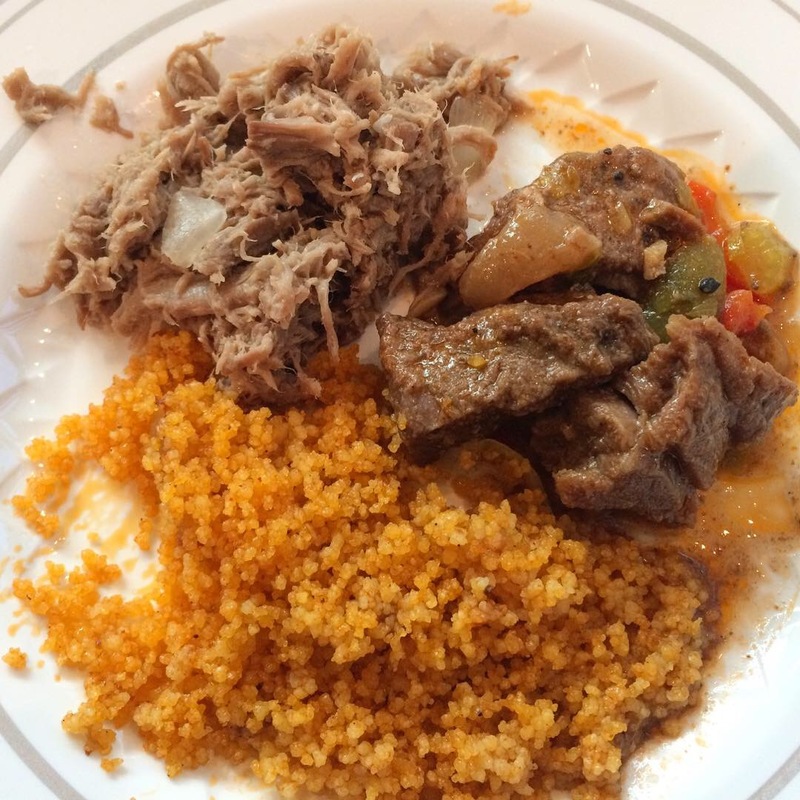 This sunbathed plate held a few examples of chicken, salmon, shrimp, couscous, rice, and potato preparations; the second photo provides a closer inspection of an artfully garnished couscous from Libya; the third shows Seswaa (shredded beef) from Botswana, Lamb Basquaise (stew) from Cameroon, and more of that sensually scented couscous. As long as I’m on a sweet roll, here’s one more from the monthly NY Indonesian Food Bazaar at St. James Episcopal Church, 84-07 Broadway in Elmhurst, Queens: a thick, creamy cloud of coconut pudding, not too sweet (why does everybody I know insist that’s somehow a good thing?) 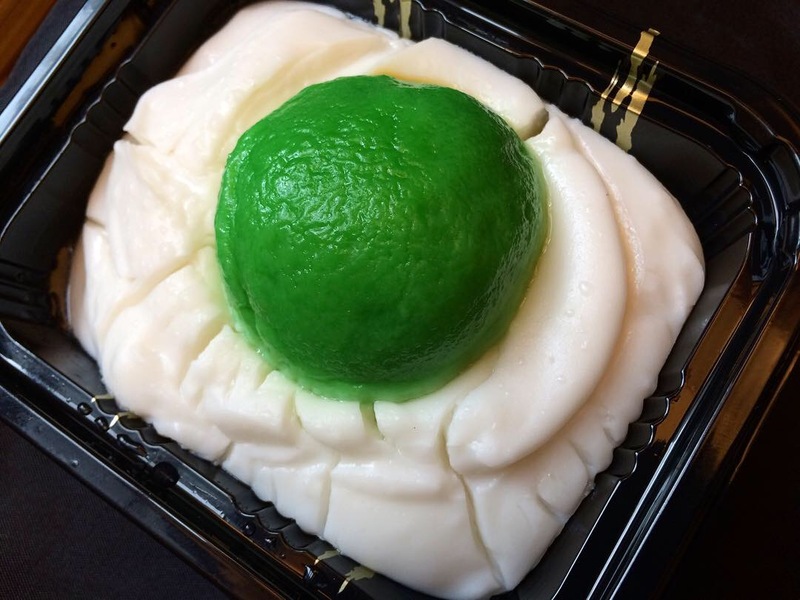 with a glutinous rice flour pandan-fortified spheroid floating atop. The second photo shows the bisected ball revealing its grated coconut/palm sugar core. The orb was hard before I warmed it up after which it surrendered into a more palatable chewiness that worked nicely with the bed of coconut fluff. It’s called Putri Mandi which means Bathing Princess. The first photo is serabi. 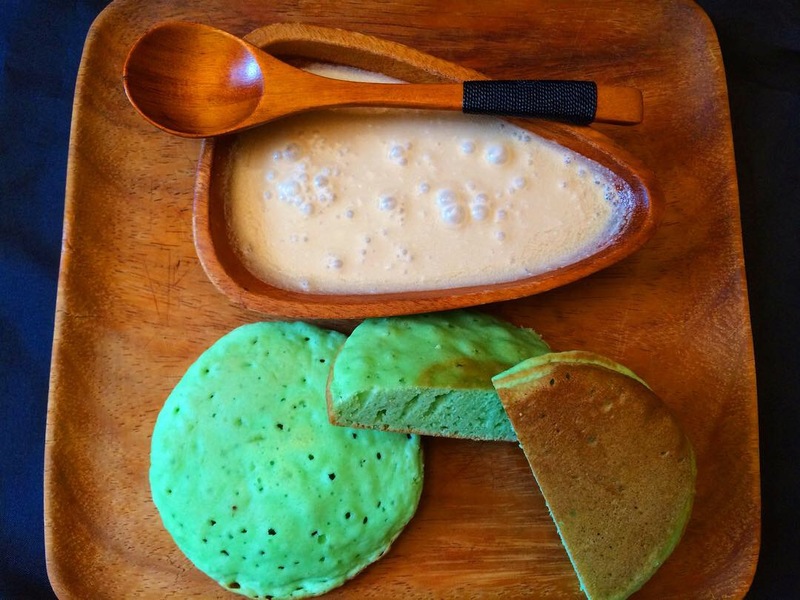 @erm718 writes, “Serabi making is very similar to American pancake making, where the batter is spread onto a lightly oiled pan, but not flipped.” (See the browned bottom of the kue in the lower right of the photo.) “Traditionally clay pans are used for serabi, but now metal pans are also used.” Holes bubble up on top as the serabi cooks. Variations exist distinguished by the thickness of the kue and the toppings; the one in this photo, serabi basah (basah means wet), came accompanied by a bag of coconut milk sweetened with palm sugar. Thicker than a typical pancake and with a light, fluffy, almost fine-crumb cakey texture, the flavor was enhanced by the addition of a little pandan essence (that’s where the green tinge comes from). Warm, anointed by the sweet coconut milk, the taste intensified; definitely a treat. The kue shaped like a flying saucer is cucur. 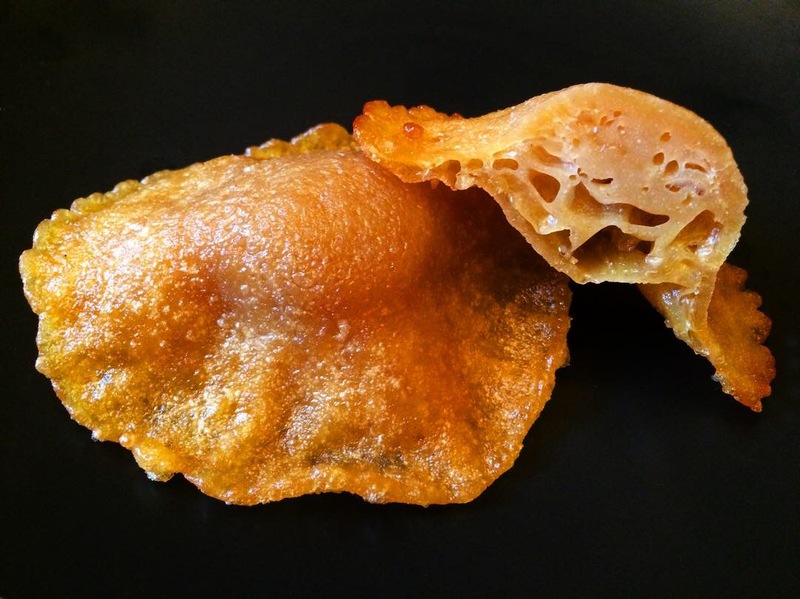 @erm718 writes, “Cucur’s batter is poured into lots of hot oil and deep fried; cucur is eaten as is.” There’s a bit of a chewy quality to it, its puffy, airy interior adding to the sensory pleasure; it benefitted from a little warming as well. Thanks for your help, Elika! Lots more to come from the bazaar…. 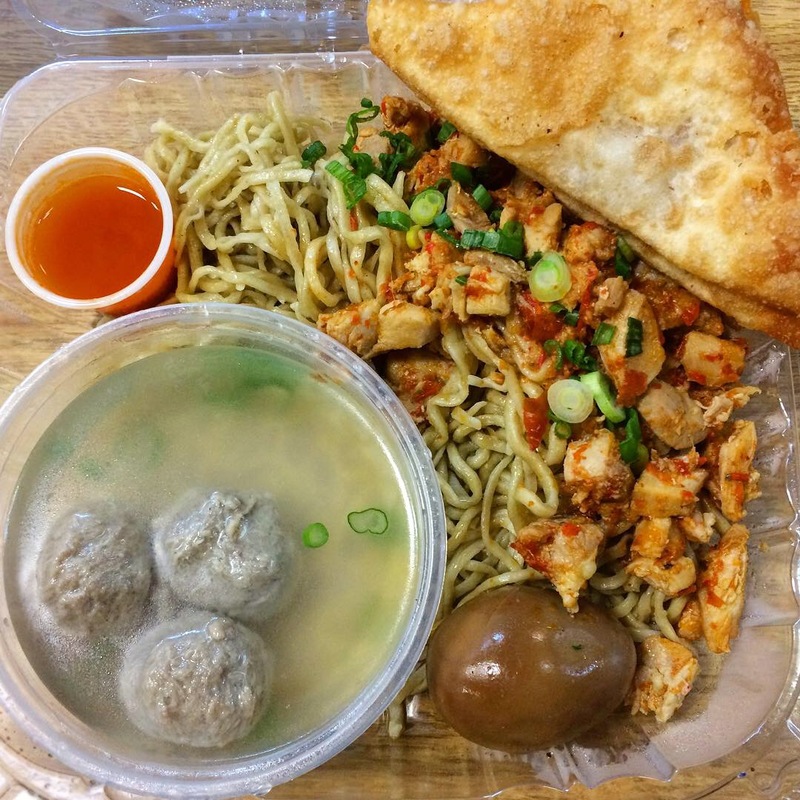 Here’s the first in a series from another visit to the monthly NY Indonesian Food Bazaar at St. James Episcopal Church, 84-07 Broadway in Elmhurst, Queens. 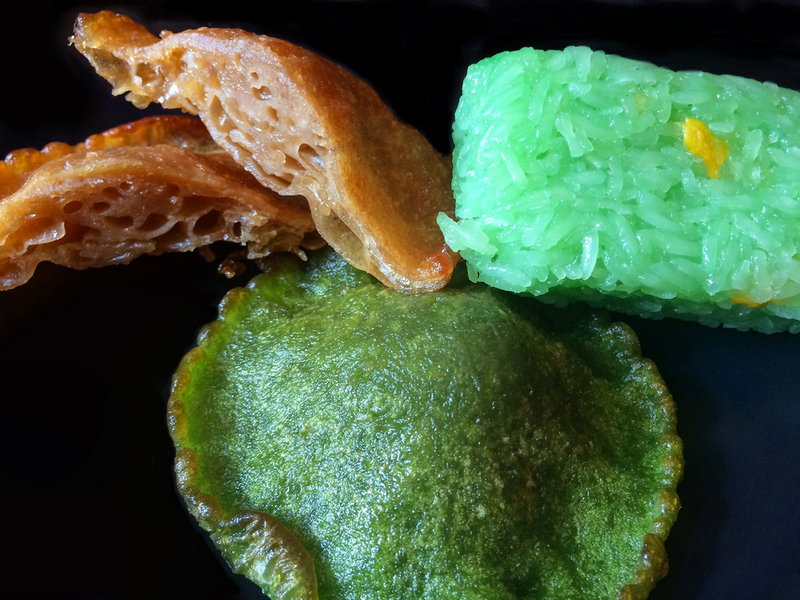 These are kue (diminutive Indonesian sweets/snacks) from Pecel Ndeso’s booth; the disk-shaped twosome are serabi solo. There are many regional variants on serabi; most are made with rice flour but some use wheat flour, and most call for coconut milk. 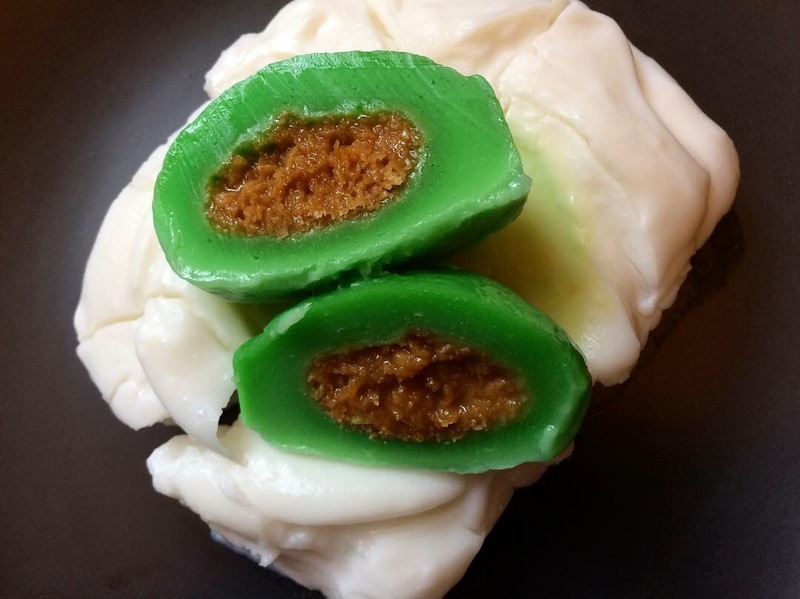 Green almost always implies pandan flavor, while brown indicates palm sugar. The cutaway view reveals the puffy, airy interior. 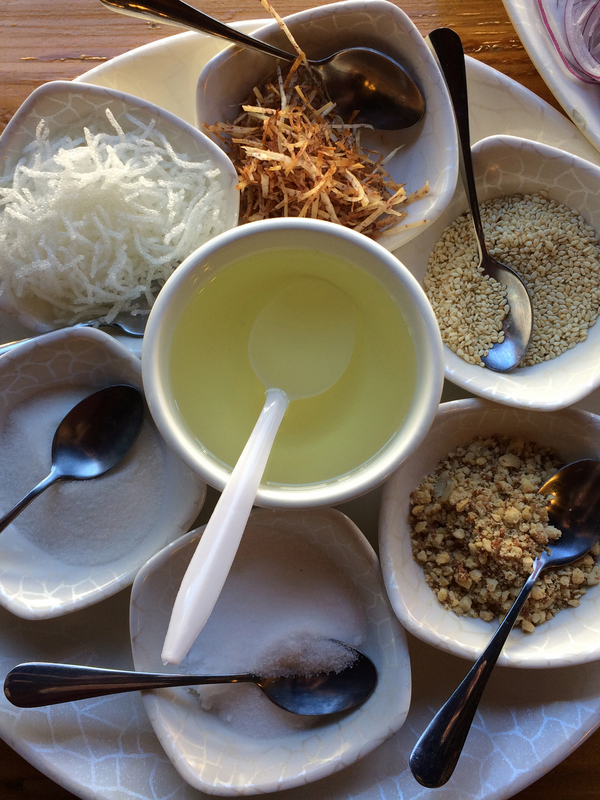 One of my all-time favorite snacks is anything that involves sticky rice pressed and sweetened with coconut milk. The Indonesian fulfillment of this wish is wajik, which I posted about on 8/16. Usually diamond-shaped (wajik is the Indonesian word that describes a diamond or rhombus shape), this sweet, green blocky rendition is infused with pandan and contains bits of jackfruit, another weakness of mine. More to come from the bazaar…. The annual event celebrating the culture of Grenada, Carriacou, and Petite Martinique took place on August 26, 2018 at St. Andrew’s Playground in Brooklyn, NY. 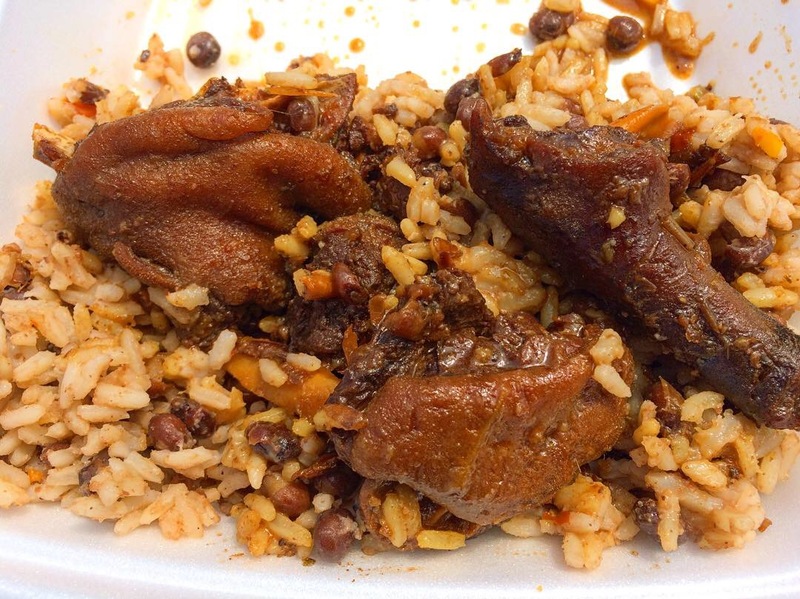 The food of the Caribbean state is what drew me in, of course, and I had set my sights on “Oil Down”, Grenada’s national dish, a stew with as many variations as there are chefs who make it. 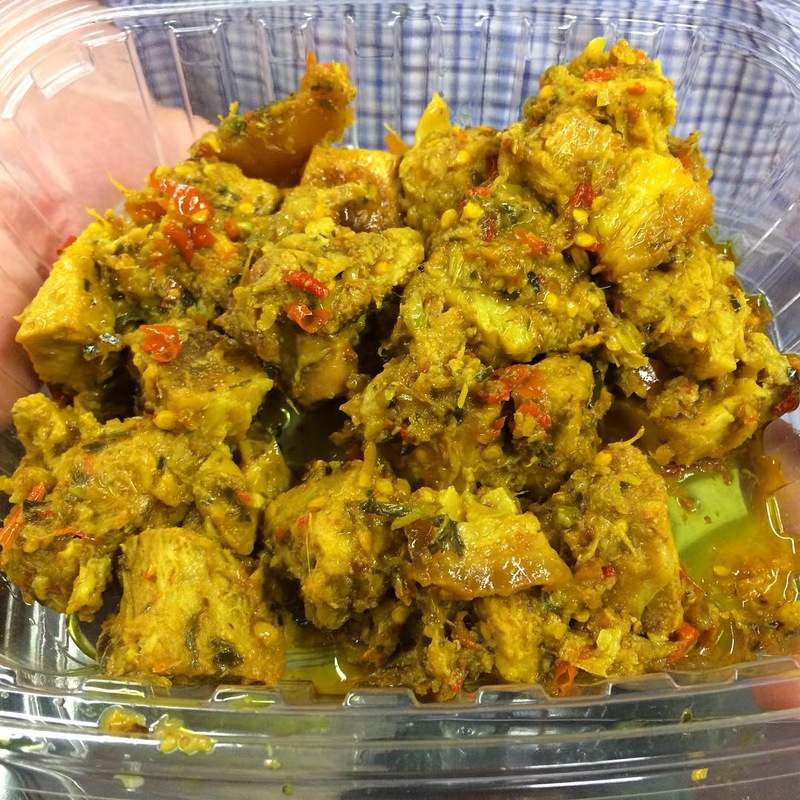 Chicken, salted meat, and salted fish all variously factor in, and expect to find dumplings, breadfruit, plantain, yams, corn and other veggies as well, but the essential common ingredient is coconut milk that suffuses everything with an indescribable richness. It’s all cooked down until only the coconut oil remains at the bottom of the pot, hence the name. 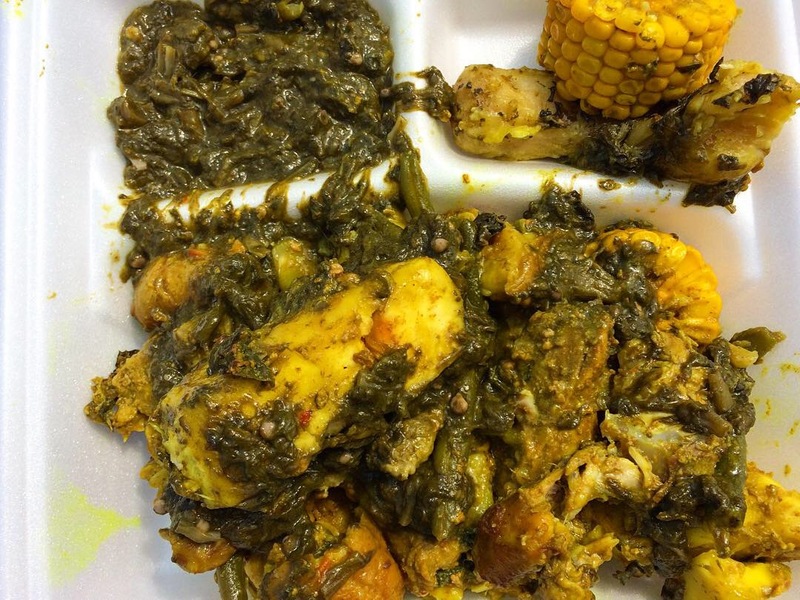 The greens adorning the top are callaloo, flavorful taro leaves, a traditional component of the dish. But seriously, if you’ve never tried it, it’s worth doing once. As with any kind of meat, the taste varies from one muscle to another, and this recipe was well-sauced making it difficult to disentangle the piquant flavors of the gravy and the meat itself, so it defies description; suffice it to say it was unctuous. And it didn’t taste like chicken.